Nicolas Bernier caught our attention recently with frequencies, a stark and compelling series of installations that illuminate the continuum between light and sound. Inspired by complex theorems and presented with elegant simplicity, Bernier’s award-winning works communicate powerful concepts in a direct and tactile fashion. The latest instalment in the series takes the particles and probabilities of quantum physics and extends that logic into the audiovisual realm. Rapid bursts of white noise and sine waves trigger a precisely jagged dance of luminous patterns in a dark and intimate space. We spoke to Bernier to uncover how theory and process combine and how to balance aesthetic beauty with thought provoking concepts. In what way do scientific theories inform your creative process? Can you give us an example of how quantum physics shapes your construction of audio and light? The clearest example is the graphics that are laser cut on the acrylic panels. I recreated these graphics from schematics found in quantum physics books. But all the graphic elements are separated on multiple panels so you only see parts of the graphics, depending on which panel is lit up. The graphic designs were based on a grid used as a measurement tool to place the different elements. At one point I found that the grid itself, made of tiny dots, was actually representing the idea really well. When those dots are illuminated, it creates a kind of infinite constellation of stars which are quite fascinating. In terms of sound, the translation of the quantum physic is quite simple: the piece is based on the idea of particles, of working with tiny elements like small bursts and clicks. This principle is applied to the formal composition, which is based on micro-montage, and then to the sound processing. I mainly used one effect, granular synthesis, to generate all the sound. I used a custom Max/Msp-based application developed by sound artist Ennio Mazzon for the label Farmacia901. In the explanation of frequencies (light quanta) there's a reference to 'organic development'. How do you go about generating 'organic' sequences of sound and light? 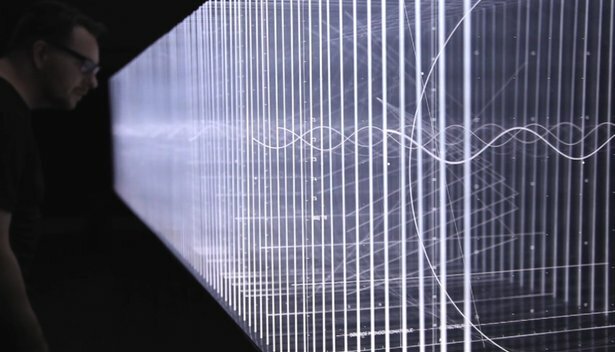 The idea of working with particles of sound was also used to create the general form of the piece, which is made of one hundred audiovisual sequences. Most of the sequences are quite short, from a couple of milliseconds to 50 seconds, with some fragments that are longer (3 to 5 minutes) to give the sense of a composed piece. The form is organic in the sense that all those fragments have been composed to be played in an aleatoric mode, again going with another quantum physics principle; its theories are often based on probability calculations. It’s nothing too complex or obscure, as is often the case in installations or works that don’t have any beginning or end. Here the aleatoric form of the piece perfectly suits the conceptual ideas. What is the compositional process like for a multi-medium piece like this? How do you split (or unify) your focus on audio, light and objects when the project is in its early stages? There is nothing systematic in the process really. Every project grows with its own speed, its own parameters and constraints. For instance, frequencies (a) started with the mechanical apparatus. As it was based on acoustic sounds I needed to build the “instrument” first. Then the light and sound have been composed in the spirit of “synchrèse”, like if it was only one audio-luminescent medium. For frequencies (light quanta), it all started with the sound. Most of it was composed as stand-alone music then further ideas came and the project evolved into its current state. But there is always a crucial point where the sound and the visual have to be composed (or at least partly reorganized) so that everything fits together. For instance, there are some audio fragments that I didn’t use because it was not working in installation mode so I changed the structure of some fragments. You can watch more of Nicolas’s work on his website.